Since our beginnings nearly 20 years ago, White Ribbon Alliance has brought diverse partners together to advance reproductive and maternal health and rights for women and girls. It’s always exciting to witness community, national and global partners bring their unique talents and resources together and realize a shared goal. 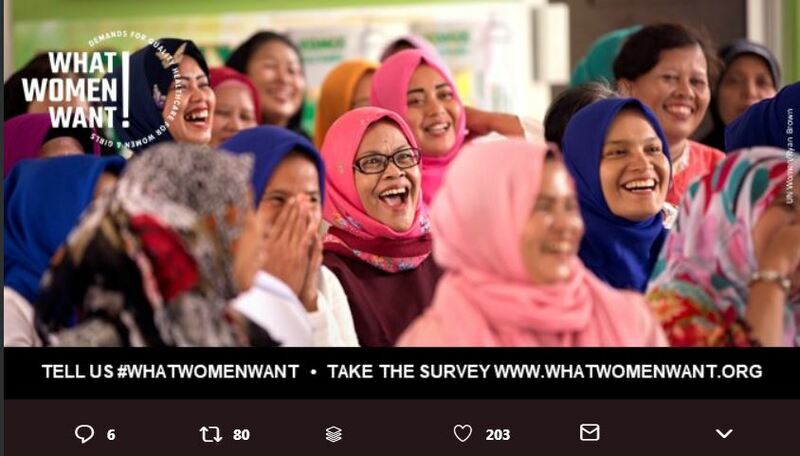 The recently launched What Women Want campaign is especially motivating given its potential to transform accountability for reproductive and maternal health at the global and national levels. Launched on April 11 – International Day of Maternal Health and Rights – What Women Want and its more than 300 partners aims to hear directly from one million women and girls worldwide about what quality health care means to them. The one question survey is simple – what is your top request for quality reproductive and maternal health care services? Simple, yet profound, because it is a question that is rarely asked and more importantly, the answers, if acted upon, have the potential to transform health for women and girls. Led by a nine-organization steering committee comprised of Center for Catalyzing Change, Every Mother Counts, E4A/MamaYe, International Confederation of Midwives, the Partnership for Maternal and Newborn Health, UN Women, Women Deliver, WRA India and White Ribbon Alliance’s Global Secretariat, all types of organizations – from community groups to global agencies – are participating in the two-year campaign. It is a neutrally-branded effort because the steering committee wanted every partner to feel that they could easily integrate it into their existing work with or without other partners. We have encouraged co-branding to help amplify our collective efforts to elevate the perspectives of women and girls as a vital and effective means to improve reproductive and maternal health. Another exciting aspect of this unique partnership is that it recognizes that while not every partner will be able to participate in every aspect of the campaign, every partner is critically important. Some have deep community connections, making them best positioned to reach the most marginalized women and girls to take the survey, others have the technical capacity that will be valuable when it comes time to aggregate the results. And still others are best suited to influence global and national leaders once the advocacy agendas have been formulated. In the spirit of recognizing everybody’s role, make sure to tag your own organization. If your organization – or you as an individual – posts the most photos on any What Women Want Wednesday, you’ll receive a byline feature as part of the What Women Want blog series with world renowned feminist publication, Ms. Magazine, also a campaign partner (more information may be requested). It’s been a thrill to watch momentum build for the global campaign, which is based on a similar effort from WRA India, who together with close to 150 collected responses from nearly 150,000 women. Those responses were turned into a compelling advocacy agenda that is influencing decision makers across the country. Once the survey collection is complete at the end of this year, we’ll analyze responses and create clear calls to action for global and national health leaders that are defined by girls and women. This will help drive demand for quality care while sending a powerful message to women and girls that their voice matters. The responses so far are beginning to paint a striking picture: my own bed during childbirth; no verbal and physical abuse; information about avoiding pregnancy; information about my choices. While still early, there is a clear call for vital investments including for more trained midwives, better equipped facilities and education around respectful maternity care, to name a few. Coming out equally strong are issues that call out the systematic gender, racial and economic inequities that persist throughout the world and are significant contributors to maternal mortality and morbidity. We know that transforming reproductive and maternal health care and health outcomes, can only happen if we challenge the status quo. A powerful starting point is supporting girls’ and women’s right to define quality health care and to demand it! So, we ask all women and girls to take the survey, because your voice matters. And we ask for all organizations who care about the health of women and girls to join the campaign. Together, we can create a world where all women and girls realize their right to quality health and well-being. The content of this blog is solely the responsibility of the author and does not represent the official views of Merck. Merck for Mothers is known as MSD for Mothers outside of the United States and Canada.